MusicMedic.com EXTREME pads are the next evolution in saxophone pad technology. They are called EXTREME because every variable related to pad life, pad sealing, and pad function have been taken into account. MusicMedic.com EXTREME pads offer EXTREME air tightness, EXTREME water resistance, EXTREME long life, and a solid firm feel. 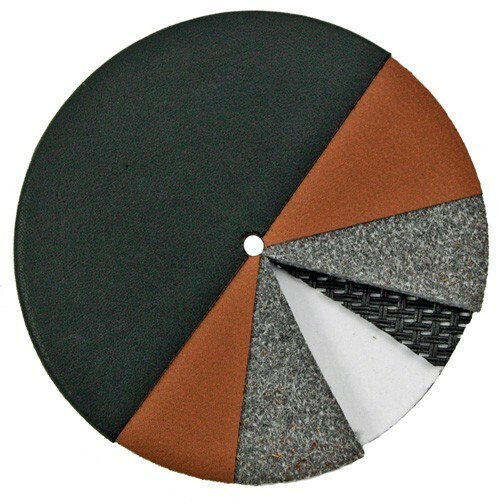 EXTREME pads consist of a synthetic mesh, our custom synthetic felt, a layer of treated air and water tight leather all held perfectly between our premium leathers and consistent chip board backing. The first layer, the backing, is a high-quality paper board which bears the name EXTREME. Chosen for its rigidity and consistency, EXTREME backing has the important job of gripping the shellac as well as hiding the magic that happens inside every EXTREME pad. The next layer, the outer leather surface of the pad is the interface between the EXTREME pad and the instrument. This is the only difference between the various EXTREME pads. You can choose to have a RooPad EXTREME where the outer skin surface is kangaroo in white, black (SaxGourmet) or chocolate. Now that you know what's on the top and bottom of an EXTREME pad, let's look at the three layers inside that make EXTREME pads so extremely air and water tight and consistent. Directly under the leather cover is a sheet of treated leather which is adhered to the synthetic felt. These are EXTREME pads so even this leather hidden inside the pad is our ultra-premium imported lambskin. The skin is treated with a synthetic, hydrophobic material that not only creates an impenetrable moisture barrier, but it also seals the pores of this leather layer, making the pad extremely air and water tight. Although the felt underneath the treated leather layer will most likely never get wet, our special synthetic felt doesn't care if it did. This felt remains dimensionally stable whether it's basking in the Texas sun or playing the blues in the moist Mississippi Delta. Wet, dry, hot, cold: this custom treated felt retains the same feel, size, and long life no matter what. Even so, we protect it with two layers of leather and our premium synthetic water treatment. After all, these are EXTREME pads, and they're extremely consistent in every way. Because saxophone pad cups vary in depth per saxophone make, model, size, and location on the instrument, pads need to vary in thickness as well. Traditionally in our industry, the pad depth is changed with the thickness of the felt or the thickness of the chipboard backing. Although we can cut our synthetic felt to the proper thickness at our shop, we found that changing the thickness of pad by changing the felt produces a pad that is inconsistent in feel. A thicker felt made the pad feel softer, and conversely, the thinner felt made the pad feel harder. This changes the feel for both the player and the installer. Likewise when varying the thickness of the chipboard backing, we found that it greatly affected the way the pads were installed, with thicker backing yielding harder pads and thinner backing yielding a softer pad. Since many saxophones are built with thicker pads in the bottom stack and thinner pads in the top stack, we needed to find a way to remove this inconsistency and give the EXTREME pads an EXTREME consistency to the player and the technician. After research and testing, we developed an industry-changing technique to change pad thickness. Our new technique allows pads of all thickness to feel exactly the same, both in terms of hardness to the player and in flexibility to the installer. 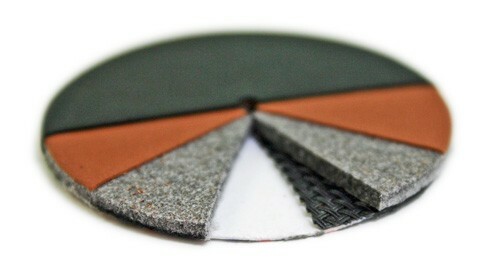 To achieve this EXTREME consistency in feel, we use a thin and stable mesh between the felt and the chipboard backing. This flexible mesh changes the thickness of the pad and does not change the feel at all. EXTREME pads are the finest sax pads available and they are 100% guaranteed. If you don't like anything about EXTREME pads up to one year after your purchase them, just return them in any condition, new or used, and we will issue you a 100% refund.